Here’s the thing, it’s not illegal to advertise a medical and/or health service or product in Australia—however, there are very strict laws around how you can do so. Yes, laws. It is considered a criminal offence to not comply to Australian Health Practitioner Regulation Agency (AHPRA) policies. Wow, that got serious quick. But we’re here to help. 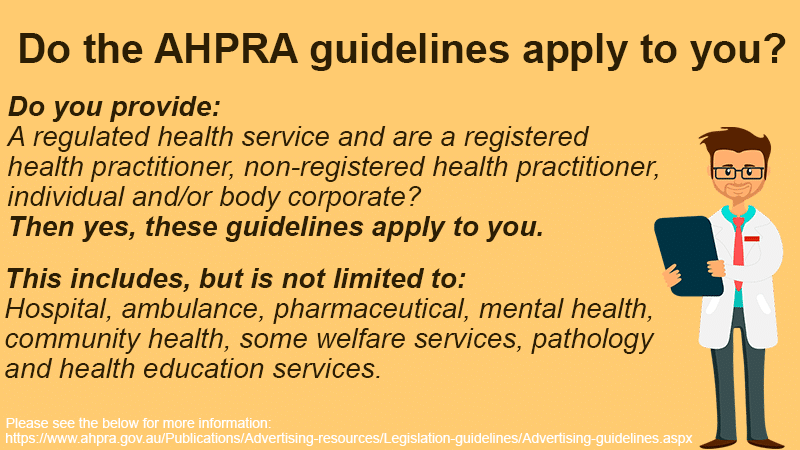 To help you learn more about the AHPRA guidelines for advertising regulated health services, we’ve put together a basic guide. Now, this guide shouldn’t replace professional legal council, but it’ll give you the gist of where you need to make any immediate changes. Decipher what is considered advertising to the AHPRA. Discover areas you may not currently comply to the guidelines. Determine your next steps if you receive a warning. Please note, some health industries (such as psychology) have different guidelines they must comply to. If you are unsure of your obligations, please seek professional legal advice. Disclaimer: This article is for general informational purposes only and in no way replaces professional legal advice. The information provided is current as of at time of publishing. Neither Localsearch nor the author are in any way liable for any misuse of this information. Please see Terms & Conditions for more information. What does the AHPRA consider advertising? Between 2016 and 2017, the AHPRA received 1,895 advertising-related complaints. We cover later on in this article what to do if you receive one, but wouldn’t it be better to avoid them altogether? Anywhere you display your products and services or advertise your business, practice or surgery, you need to be cautious. This includes if you offer your opinion to a newspaper, magazine or other publication. The testimonials and reviews you receive from patients, clients or customers may also be considered part of the advertising guidelines. For more information, visit the Testimonial Tool on the AHPRA website. How do I help ensure my advertising is compliant with the AHPRA guidelines? While the AHPRA guidelines sound scary, when you know the rules, marketing your business or practice becomes easier. You simply need to be cautious of what information you put out there as you are obligated to manage every communication. Be false, misleading or deceptive, or likely to be misleading or deceptive. Offer a gift, discount or other inducement, unless the terms and conditions of the offer are also stated. Use testimonials or purported testimonials about the service or business. Directly or indirectly encourage the indiscriminate or unnecessary use of regulated health services. Could this be misleading or misinterpreted? Will the reader, listener or viewer receive all the information they need to know? Is an unrealistic expectation being created? Is evidence stated and strong enough to support the claim? Would someone be possibly confused by this? There are some particular words commonly used in medical advertising that need to be used carefully or not at all (if in doubt, leave it out). Proven/effective/treats: If you plan on using these terms, you will need to provide the studies to support your claims. For example, you may discuss a study performed by XYZ on x amount of people with x results. However, unless this is part of a bigger article, you may want to avoid it altogether. Cure/treat: The AHPRA recognises not all improvement for a condition or disease may be the result of a treatment. This means you cannot claim a treatment or product you offer will cure or treat anything outright. It is considered appropriate to say a treatment, service or product may help with symptoms, as it avoids an indirect promise of a certain outcome. Again, this is a small sample of the guidelines and recommendations from the AHPRA and you should perform your own research or seek professional legal advice. What do you do if your business receives an AHPRA advertising warning? Firstly, don’t panic. While the process can change between the complaint matter and business or operation type, you will normally receive a period of time to correct the issue. If this is the case, the case will be reassessed at the end of the allowed correction period. For more information, we recommend visiting the Complaints Process page on the AHPRA website. Have you checked your Localsearch business profile? A Localsearch business profile is considered advertising. If you are classified as a Regulated Health Service Provider, we advise regularly checking your advertising meets the latest guidelines. You can find changes you can make to your business profile in our best practice guide. Remember, even if someone else writes your marketing communications, in the eyes of the AHPRA, you are the liable party.